William Allen Emerson grew up in St. Petersburg and went to the University of Florida. He slept on the post-office steps in Gainesville on the night of the Pearl Harbor attack so that he could be among the first to enlist on December 8, 1941. 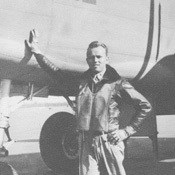 He was stationed in Okinawa, where he flew with an anti-shipping squadron. 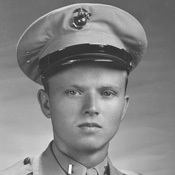 He was then selected to serve as a flight instructor in North Carolina and Okinawa. After the war he returned to the University of Florida where he received a degree in business. He went on to enjoy a successful 40-year career with Merrill Lynch, where he retired as a senior vice president and national sales director. Below are excerpts from an oral history interview with William Emerson describing his childhood in St. Petersburg, his memories of the attack on Pearl Harbor, and his experiences in World War II. The oral history interview was conducted by Jim Schnur, Special Collections Librarian, Poynter Library, University of South Florida St. Petersburg in January 2009. Discusses his early years of growing up in St. Petersburg, the University of Florida, and early work experience. Discusses where he was when Pearl Harbor was bombed. Talks about sleeping on post office steps to be first in line on Dec. 8th. Commentary on this being the last time we, as a nation, were united and the uniform was respected. Discusses memories of his training experiences and acceptance into Marine Corps. Discusses flight training in New Orleans. Tells the story of his first battle in Okinawa, Japan. Discusses what he was doing on a daily basis while in the Pacific Theater. Shares funny story about sanitation officer moving latrine. The story about getting news/mail of the birth of his first child. Tells story of becoming a flight instructor. Talks about being an instructor including a story of a crash that was his fault. Also briefly discusses life in Pensacola while he was training – anyone wearing a uniform was a hero. Discusses dangers of flying in Okinawa. Shares story about flying to Tokyo to investigate his former commanding officer. Discusses the danger of flying and being a flight instructor. Tells story of getting lost during flight and running out of fuel as they land. Also tells a story of ducks hitting plane while in training sessions – compares to recent Hudson river story. 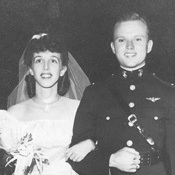 Humorous story about bringing home pure silk parachutes to his wife. Another humorous story about buying her a kimono in Tokyo. Tells a funny story of how he got home. Discusses years after the war including return to college, living at FlaVet Village at University of Florida, and the University of Florida campus after the war. Discusses years after finishing his degree at UF including being a bank teller and training to work at Merrill Lynch. Discusses changes in St. Petersburg in years after the war, including St. Petersburg’s famous green benches. Discusses his successful career at Merrill Lynch beginning with training in commodities. Discusses keeping in touch with other vets and high school mates. Tells a story about meeting his future wife as he is preparing to marry someone else and she is visiting her fiancée. Jokes that his wife drew aerial maps during the war and that is why he kept getting lost.